It was the summer of 1988. For the previous six months, thousands of Palestinians had been confronting Israeli forces in an uprising that would later be known as the First Intifada. In the front seat was Benny Gantz, a young officer. The night was suddenly lit up by Molotov cocktails exploding all around the vehicle. The Israeli soldiers jumped out with assault rifles raised but their attackers had already fled. "Other commanders would just say shoot everywhere. But not Benny," said Dan Emergui, one of the soldiers. "He's calm and he's cool. If he doesn't have a reason to shoot, he won't." Three decades after the ambush, Mr Gantz is again trying to hold his nerve under fire, this time in the midst of the ugliest election campaign in recent Israeli history. 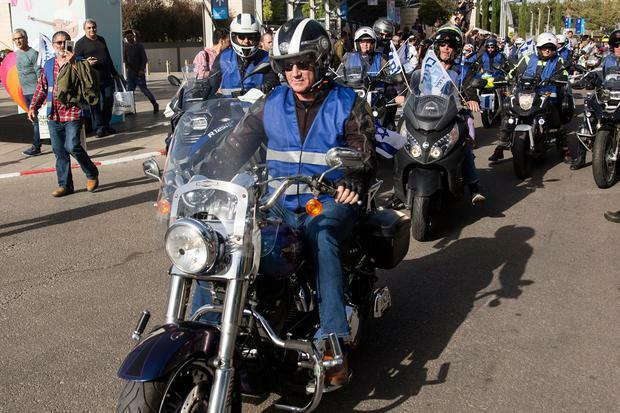 The 59-year-old son of Holocaust survivors, who rose to be Israel's top general, has led his centrist Blue and White coalition to within striking distance of toppling Benjamin Netanyahu after a decade in power. The final polls before tomorrow's election show Blue and White winning more seats than Mr Netanyahu's Likud party. However, the same polls also show right-wing parties with a narrow majority in parliament, which might be enough to keep Mr Netanyahu in office. In a last-minute bid to win over right-wing allies, Mr Netanyahu promised over the weekend that he would annex all Israeli settlements in the West Bank, a step he has shied away from in the past. Mr Gantz's campaign has been relatively light on policy. On security, he has taken similar positions to Mr Netanyahu and sometimes tried to outflank him in hawkishness. He refuses to say whether he supports the idea of a Palestinian state and has promised to continue Israel's campaign to drive Iran out of Syria and seek better relations with the Gulf Arab states. His main pitch to voters is that he is the candidate of decency while Mr Netanyahu, who is facing criminal corruption charges, is prepared to tear Israel apart to hold on to power. "We are speaking about a corrupt man who is destroying the country," Mr Gantz said. Meanwhile, Mr Netanyahu and his allies have pummelled Mr Gantz as a paranoid delusional and tried to scare Jewish voters with claims he would bring the Arab minority parties into government. Mr Gantz suspects the prime minister's aides were behind the leak of a report that his phone was hacked by Iran, which prompted Mr Netanyahu to claim his opponent was vulnerable to blackmail by Israel's enemy. Several measures indicate how much Israel has shifted to the right lately. Around 63pc of Jewish Israeli voters identify as right-wing, compared with just 15pc for the left and 18pc who consider themselves centrist. Surveys show young Israelis, who grew up amid a wave of Palestinian suicide bombings in the early 2000s, appear more right-wing than their parents' generation. Mr Gantz hopes his appeals for national unity, bolstered by his military credentials as the chief of staff who commanded Israeli forces during the 2014 Gaza War, will be enough to turn the tide.